From 1834, this property was owned by Edward Malloch, merchant, member of the Legislative Assembly, land speculator, mortgage broker, and county sheriff. Although Edward moved from Richmond to Bytown in 1840 he continued to own large tracks of village land. After his death in 1867, his wife, Margaret, daughter of the legendary Maria and Andrew Hill, continued to own much land in the village including this lot. The exact date of the construction of the house is unknown but Margaret Malloch may have had it built for her mother and stepfather, Andrew Taylor. 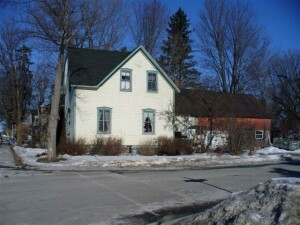 This property had a long connection with the veterans of the War of 1812 and early settlers in the village. The lot was originally deeded to Major Sewell Ormsby, a half-pay officer, in February 1834. In November of the same year, he sold the land to Edward Malloch. A 1863 map of Richmond shows no building on this lot. In 1879, the authors of the Historical Atlas of Carleton County described Mrs. Taylor. This picture of Maria Taylor is confirmed by an account written by Mr. Walter Shanly and printed in Kingsford’s History of Canada. Mr Shanly confirmed Mrs. Taylor’s sharp mind and described the scene he encountered on June 12, 1881. After Andrew Taylor’s death, Maria continued to live here and died in 1881. Margaret Malloch, herself a widow (Edward had died in 1867) owned the property until her death, and, in 1887, her estate sold the house to Andrew Graham. In 1902, a village merchant, James Brown purchased the house. He and his brother, Robert, operated Brown Brothers’ store across McBean St., first at 3550 and then at 3556. The property was purchased by Samuel Knox in 1946 and remained in the Knox family until 2000. 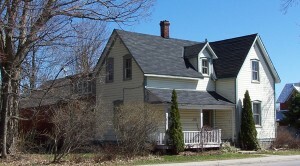 This is an example of a Victorian vernacular farmhouse. It is a three-bay, wood frame, clapboard building with gable roof. The wood siding is original. The house is one of the few buildings in the village that still has its original sheds. The summer kitchen and shed are outlined on a fire insurance map dated 1889. The foundation is limestone laid in a coursed rubble format; the walls are 18″ thick. Floysvik, H. An architectural and social history of a heritage home. 2003 Algonquin College. Kingsford, William. The History of Canada. Vol IX (1815-1836). Rowsell & Hutchison: Toronto:1897. This entry was posted in Locations and tagged House. Bookmark the permalink.